Generic Profiles are great for testing out Fotospeed papers with your printer and ink combination. The generic profile however, will never be as accirate as a Custom ICC Profile. We can make this for you Free of charge with all the papers that we distribute. 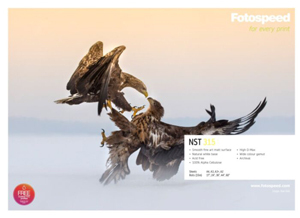 Download or Fotospeed Profiling Pack to have a custom profile made. Download the Adobe Color Printer Utility (ACPU) specifically designed to print your targets (Colour Profiling Charts) without Color management applied. When configuring your printer, make sure that the HIGH SPEED setting is Un-Ticked. The printer will then print in one direction. Selecting HIGH SPEED (Bi-Directional) printing is fine to reduce printing times, but as your printer gets older, and wear takes place, it may be better to de-select Bi-Directional printing if fine banding can be seen (This is because due to wear, the line of printing in each direction differ very slightly) and print in one direction only. The printer prints in one direction only (from right to left [unidirectional printing]). Unidirectional printing is slower than bidirectional printing, and recommended for highest quality image printing. When installing new pigment ink cartridges, shake them well. (Pigment ink settles over time). When printing Photographs, load the paper single sheet at a time, to avoid misfeeding. If your printer misfeeds on certain papers, even if you only load one sheet, pre-feed the paper into the printer. Wherever possible, print one single sheet at a time to prevent print surface damage. Never stack prints for drying. Prints should be dried as quickly as possible and stacking them retards the drying of all but the top print. This is very important, because ink spreads whilst wet (Dot Gain) and delaying this drying process, may allow the inks to carry on spreading, causing unsharpness, in particular on Art type papers. Allow the print to fully dry before assessing the colour. Carry out a nozzle check before a print run. If you find gaps in the nozzle check printout pattern, carry out the cleaning procedure until you get a perfect printout pattern. Only then should you start printing. When using Art Papers shake each sheet just before printing onto it. This is because some Art papers, because of their construction, may have loose fibres on the surface and if these fall off after printing they may leave small unprinted white patches. The main problem that people ask me about is that their print looks darker than their monitor screen. Providing that you do not make changes to the print in your editing software, a print made using the same print settings each time, will always be the same brightness, even if you change the brightness of the screen. created and used for your MONITOR are totally independent profiles and do not have an effect on each other. People tell me that they have calibrated their monitor and have a custom profile for their PRINTER/INK/PAPER combination and the screen and print still do not match. In this case I would either re-calibrate my monitor and select a lower luminance value or if this is not an option, turn my monitor brightness down to match the print. When a monitor is calibrated, any good calibration software will offer you the choice of luminance level measured in cd/m2 and the level selected, will affect the brightness of your screen. If your monitor screen brightness is higher than of your print then your monitor has been calibrated with a too high a luminance value, (assuming that your printer profile is correct). A value between 90cd/m2 to 120cd/m2 is recommended. If you cannot adjust the luminance value in your monitor calibration software then you will have to use the brightness control on your monitor to match your monitor brightness to the print brightness. When judging your print brightness to your monitor brightness, it is important to view your print in a light source that it will be used for normal viewing. I recommend a daylight balanced light such as below. Paper and ink profiling is very important for printing correct colour. Most people rely on choosing generic profiles that are supplied by the printer manufacturer. Generic profiles by their very description are nothing more that general profiles to suit a range of printer/ink/paper combinations and because of this the results can vary wildly. For accurate printing you must use a Custom Profile for every printer/ink/paper combination that you use. By using a Custom Profile you will utilise your printers full capabilities and in return you will get more accurate,vibrant and saturated colours. You will also use less ink and make less wasted test prints. This means better quality prints, in less time and for less cost. WHAT PAPER AND INKS SHOULD I USE ? the papers and inks that your printer manufacturer recommends. There comes a time when the inks and papers recommended by the printer manufacturer do not meet your requirements in terms of PAPER PROFILING, INK COSTS, TYPES OF INK, TYPES OF PAPER or LONGEVITY OF PRINTS. Let us look at these requirements one by one. If your printer uses color cartridges where all the colours are in one cartridge, as soon as your printer detects that ONE of these colours need replacing, it will tell you to replace the cartridge and because the usage of each colour can vary greatly, depending on the subject you print, it will be most likely that you will be throwing away the other colours of ink that haven't run out. 1. When you buy a printer look for one that has an individual cartridge for each colour of ink. 2.Buy a printer with large capacity cartridges. This is fine if you are printing a lot of images and therefore using a good deal of ink. 3. Fit a Bulk Ink Feed System. This is the most cost effective way of saving on ink costs. This type of system works by piping ink from bottles outside your printer to a modified ink cartridge. These inks are normally used in printers that are mainly intended for printing text. They can be best described as Plug-N-Play inks due to the fact that they do not require any special profiles for normal use. The problem with dye based inks is that the colours can fade very quickly. These are the inks that you should use if you require high print permanence and are intending to sell your prints but they are expensive and almost certainly need print/paper profiles to get the best out of them. They also provide a slightly smaller colour gamut. You may want to try out different papers so let us look at some of the different types available. These are the types of papers preferred by some wedding photographers. They give the image a softer feel(not necessarily less sharp)than a glossy paper would and there are less reflections from the surface, which make viewing easier. A lot of people still think that this is the main type of paper for Photographic printing. Glossy Papers make the images look crisper, and used to be the first choice for printing images containing fine detail, but the continuing improvements in paper producing technology and coatings mean that even the heavyweight Art Papers can now hold fine detail. 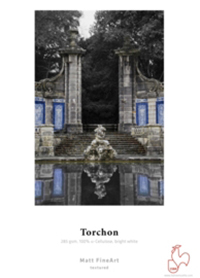 This new range of papers and newly developed coatings, give the look of the traditional Fibre Based darkroom paper. 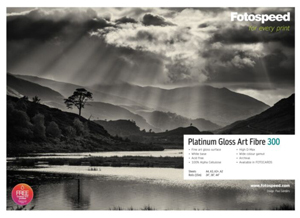 I use the Fotospeed Platinum Gloss Art Fibre 300 Paper. This heavyweight exhibition quality paper is truly outstanding for both colour and B&W prints, exhibiting beautiful rich blacks. This is without doubt my favorite paper. The latest trend in ink-jet printing paper is Baryta. While it is new to the digital printing world it actually has its roots in high quality B&W printing papers from our past. 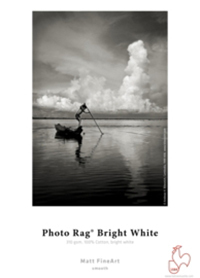 Baryta is barium-sulphate, a clay-like material that is applied to a fiber paper substrate. On a new breed of papers designed for ink-jet printing with pigment-based inks, Baryta is being used to provide a smooth reflective coating. 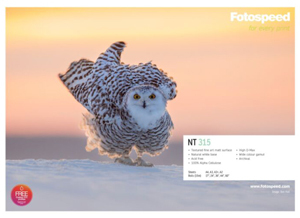 The Fotospeed Platinum Baryta - 300gsm paper keeps the most delicate highlights with smooth transitions and gives the deepest blacks, resulting in the traditional Baryta darkroom look and feel from an ink-jet paper.. In the past few years these papers have advanced from being smudgy printed watercolour papers to first class, true Photographic Art Papers capable of retaining fine detail. There are many types now on the market and only by trying some of them out will you find one or more to suit your personal requirements. What are the best Papers to use? Paper choices are very personal, and I would recommend you try various papers until you find the ones that suit your needs in terms of Appearance, Sharpness, Feel, Price and how they print with your equipment and inks. By all means take note of recommendations but try for yourself. This paper is currently my favorite for my B&W printing. 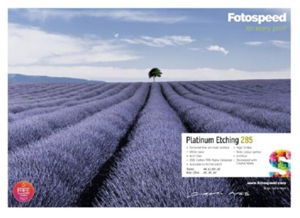 Platinum Baryta 300 is a 100% acid free, Fine Art paper with a smooth unglazed gloss surface. A natural white base and state of the art micro-porous ink receiving layer delivers a high D-MAX (2.7) and wide colour gamut. 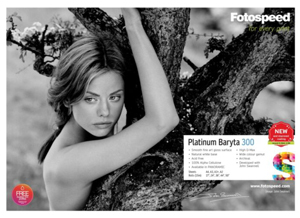 Platinum Baryta 300 reveals delicate highlights and smooth transitions to shadows for both colour and B&W printing. The paper is approved by the Fine Art Trade Guild and when used in conjunction with pigment inks will ensure a print life of more than 85 years. This paper is one of my favorites for my B&W printing. This paper is currently my standard all-round paper. If I could only use one paper for all my printing, then this would be it. Made from 100% alpha-cellulose pulp, Platinum Gloss Art Fibre 300 is a heavyweight exhibition quality paper, and is protected against environmental influence, so prints will last for decades. The paper’s archival quality makes it ideal for professional or amateur photographers who want to create long-lasting images, while its glossy finish and tonal range makes it a good choice for those who don’t want to lose detail when shooting in bright conditions. 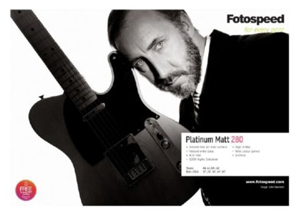 Platinum Matt 280 is a 100% acid free, Fine Art paper. A natural white base and state of the art ink-receiving layer, delivers a high D-MAX and wide colour gamut. When used in conjunction with pigment inks, the paper will ensure a print life of more than 85 years. 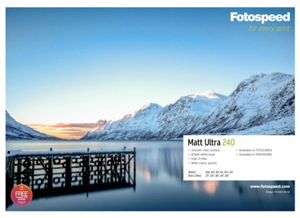 Matt Ulta 240 is a smooth, bright white, middle-weight, all purpose paper with a matt finish. This cost effective paper is ideal for running proofs or printing final images. Matt Ultra's wide colour gamut reliably delivers beautiful images every time. Matt Ultra 240 is one of the most cost effective papers we have on the market. Originally launched in 2001, it quickly became a firm favourite. it was designed for photigraphers to do secondary proofing and contact sheets, but they quickly realised the quality was there to print final images. A paper well worth exploring. This is currently my standard bright white art paper. This is currently my standard natural white art paper. 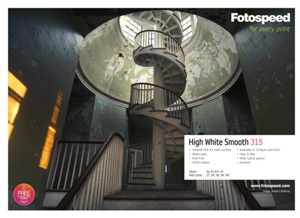 High White Smooth 315 is a 100% cotton and pH neutral, Fine Art Paper with a smooth surface. 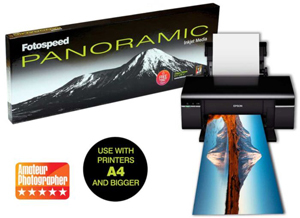 A white base and a state of the art ink-receiving layer, delivers a high D-MAX and wide colour Gamut. this paper is highly recommended for Gicleé printing.The paper is approved by the Fine Art Trade Guild and when used in conjunction with pigment inks will ensure a print life of more than 85 years. This is currently my standard slightly textured art paper. Platinum Etching 285 is a new 100% acid free, Fine Art paper with a velvety, textured surface. A natural white base and state of the art ink-receiving layer, delivers a high D-MAX and wide colour gamut Platinum Etching is 25% cotton and 75% alpha-cellulose. When used in conjunction with pigment inks, the paper will ensure a print life of more than 85 years.. This is fast becoming one of my standard natural white art papers. Smooth Cotton 300 is a 100% cotton, pH neutral, Fine Art paper with an ultra-smooth surface. 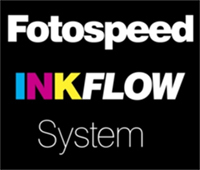 The paper’s white base and state of the art coating delivers the highest level of ink load of all the Fotospeed range. Smooth Cotton 300 is therefore ideal for high saturation images. When used in conjunction with pigment inks, the paper will ensure a print life of more than 85 years. Natural Soft Textured 315 is a 100% acid free, Fine Art paper with a very gentle texture. 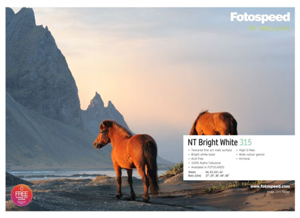 The paper’s natural white base and gentle texture lends itself towards landscape and portrait subjects and delivers a high D-MAX and wide colour gamut. The paper is approved by the Fine Art Trade Guild and when used in conjunction with pigment inks will ensure a print life of more than 85 years. 6. Fotospeed Natural Textured 315g. Natural Textured 315 is a 100% acid free paper with a full, rounded texture. The paper’s natural white base adds a more traditional feel and is therefore especially suited to artistic images or watercolour reproductions. When used in conjunction with pigment inks, the paper will ensure a print life of more than 85 years. Natural Textured Bright White 315 is a 100% acid free paper with a full, rounded texture. The paper’s bright white base adds a more traditional feel and is therefore especially suited to artistic images or watercolour reproductions. When used in conjunction with pigment inks, the paper will ensure a print life of more than 85 years. 8. 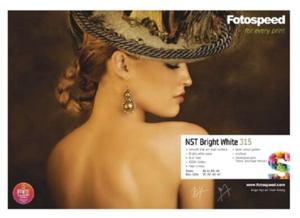 Hahnemuhle Photo Rag Bright White 310. 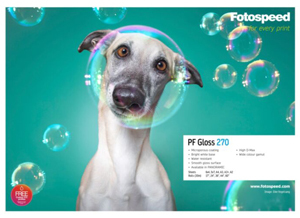 Pigment Friendly Gloss 270 is a flat, stiff, middle-weight paper with a high gloss finish. The paper has a bright white base and an instant dry, micro-porous, coating. Pigment Friendly Gloss’ wide colour gamut and high D-MAX delivers beautiful images, both in colour and B&W. 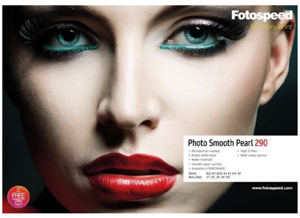 Photo Smooth Pearl 290 has a natural white base and an instant dry. micro-porous coating. The paper's wide colour gamut and high D-MAX delivers beautiful images, both in colour and B&W. 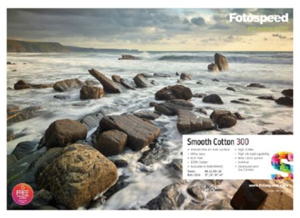 Over the last two years, Fotospeed have worked on creating the perfect Smooth Pearl digital paper. This paper has become a market leader and is the reliable go to paper for photographers the world over. 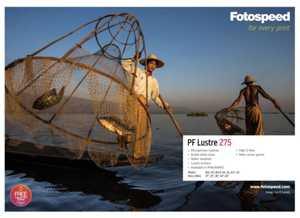 PF Satin 270 is a pure flat, stiff, neutral white base, heavyweight paper with a smooth satin finish. Similar to our PF Lustre 270, but with a marginally warmer base tone, PF Satin 270 offers something slightly different. Unlike other brands of this type, PF Satin 270 is excellent with both pigment and dye based inks. 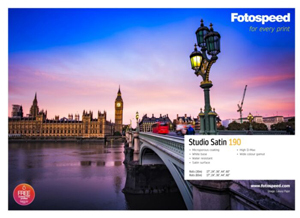 Fotospeed have also created a simple printing template which can be used in Photoshop, Lightroom and many other programs. . The issue of longevity is very complex and in the early days of this technology, it is not possible to be categorical about results. The papers used for digital ink jet printing fall into two categories, coated and uncoated. The coatings applied are specially formulated to give good ink hold out and low dot gain, ensuring a sharper image. The formulations of the coatings are a closely guarded commercial secret by all manufacturers. Uncoated papers will give better longevity than equivalent papers which have been coated, but will not give as good a printed result. Pigmented inks will give better longevity than dye based inks, but tend not to give such a good colour gamut. Longevity is improved when ink density is increased. - This is part of the reason uncoated papers give better image life, because they require greater ink saturation to provide the same colour density. Since the inks sit more on the surface of coated papers it is subjected to more environmental degradation and radiation. Chemical contamination from the atmosphere or other chemicals such as the organic solvents in glues will seriously affect paper coating, potentially causing discolouration. Some glue in adhesive tape does not even require direct contact with the paper to cause discolouration. Tests indicate that there are instances when a particular tape does not cause a problem when in direct contact with the paper. However, the same tape with an acidic ‘catalyst’, such as packaging board adjacent to the paper, will result in discolouration. Archival, pH neutral tapes are available and tests suggest they are less likely to cause a problem. See www.ukindustrialtapes.co.uk for more. The atmosphere in London is approximately pH 4.5. The effect of this on coatings, inks or the reactions between the two is unknown. All organic matter, including paper, is bio-degradable and as such should be treated with care. Papers, which are bright white, contain varying degrees of Optical Brightening Agents (OBA). The OBA converts the longer wavelength ultra violet light into the blue end of the visible spectrum. This "blue-whiteness" reduces as the unstable OBA degrades. This results in paper looking slightly more yellow than originally. This is quite separate from a paper being Neutral pH or Acid Free. If the whiteness of paper is achieved by the use of stable compounds such as Titanium Dioxide, their colour will better withstand the adverse effects of light radiation. The “guarantees” associated with many products are dependent on compliance with certain conditions. It is invariably the case that the end user would be unable to subsequently prove that they have complied with any of them for the whole life of a print. e.g. constant temperature, constant relative humidity, fixed light intensity, within certain spectral parameters and with specific shielding. Changes in relative humidity affect life expectancy, though like many of the variables, the extent and nature of the effect is not certain. The life expectancy tests conducted do not seem to give figures for standard deviation of expected result errors, despite extrapolation of limited data over a short period to expectations many years into the future. This may explain why tests conducted on the same paper sold under different brand names, with the same ink sets, has provided widely varying results. Many tests involving high levels of radiation result in raised temperatures, which may affect the accuracy of the extrapolation. It often seems that the questions asked about the longevity of prints are new. This is not the case. The issue has been a subject of discussion for all types of printing methods for years. Many consider that one of the great advantages of digital prints is that they can be reproduced at any time, with confidence that they will resemble the original. The Guild of Fine Art has always insisted that a set of prints had to be produced in one run, in order to be faithful reproductions, because there were assumptions made about how they would be printed. This view now seems a little out-dated. In conclusion, it can be said that when considering longevity; to use pigmented inks is better than dye based inks, uncoated papers are better than coated papers and the careful handling and storage of a print is necessary. Clifford Burt - R. K. Burt & Company Ltd.
Have you a blocked print head? 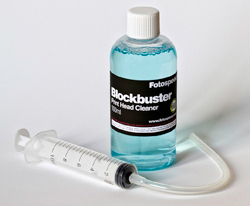 FOTOSPEED Blockbuster Print Head Cleaner is the answer. Blockbuster Printer Head Cleaner comes complete with a syringe and tubing plus instructions on how to use the kit.